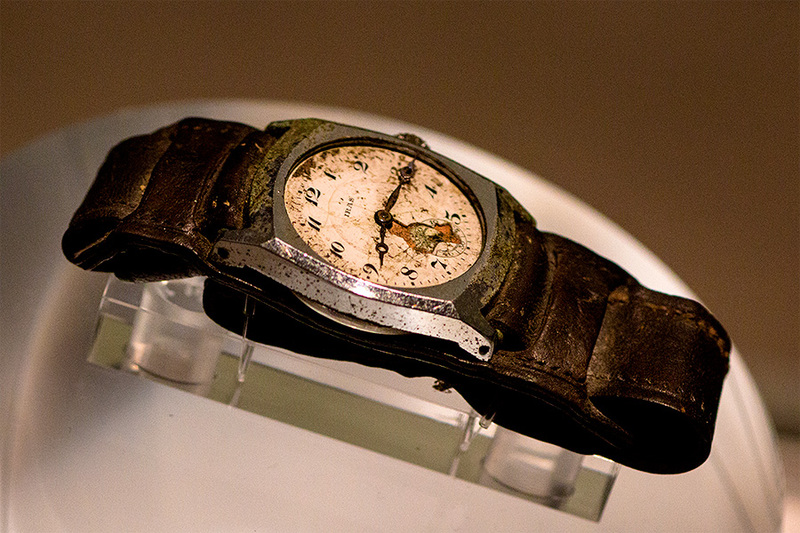 A wrist watch stopped at 8:15 AM — a relic from August 6th, 1945, on display at the Hiroshima Peace Memorial Museum. 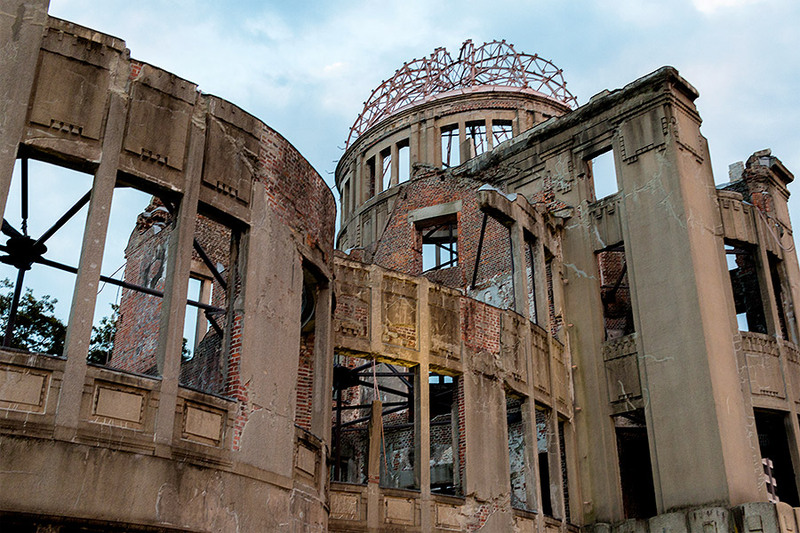 Hiroshima’s A-bomb Dome, the final punctuation mark of a world at war. 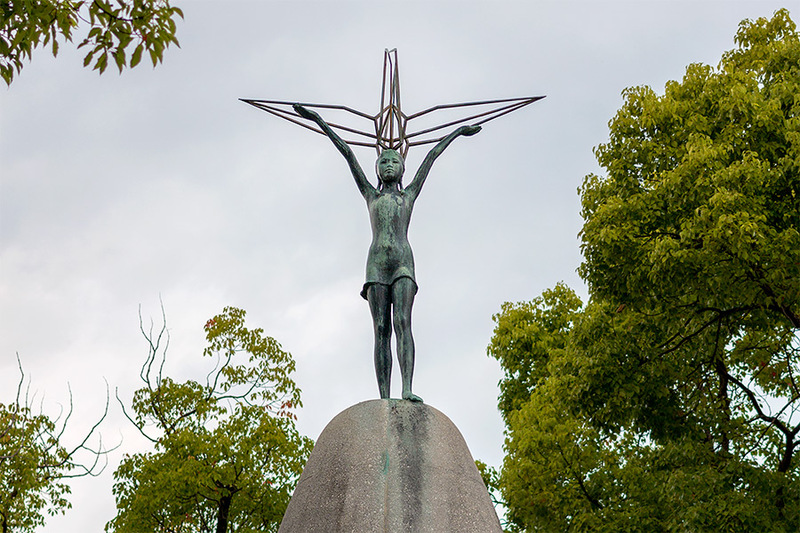 The Children’s Peace Memorial Monument, surmounted by a statue of Sadako Sasaki, a little girl who died of acute onset leukemia 10 years after the bombing due to the effects of radiation. 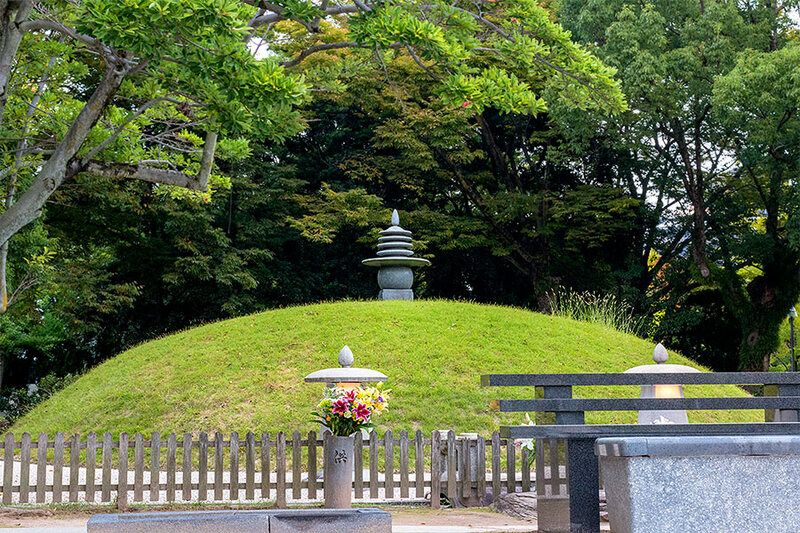 The crypt beneath the Peace Memorial Mound contains the ashes of more than 70,000 unidentified A-bomb victims. 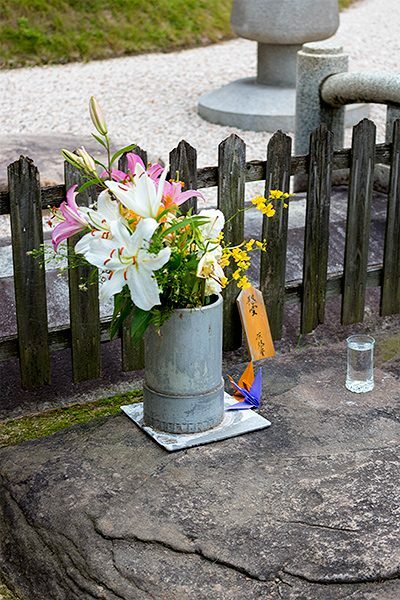 Flowers, origami cranes, and water — offerings to the A-bomb victims commonly found in Hiroshima’s Peace Memorial Park. 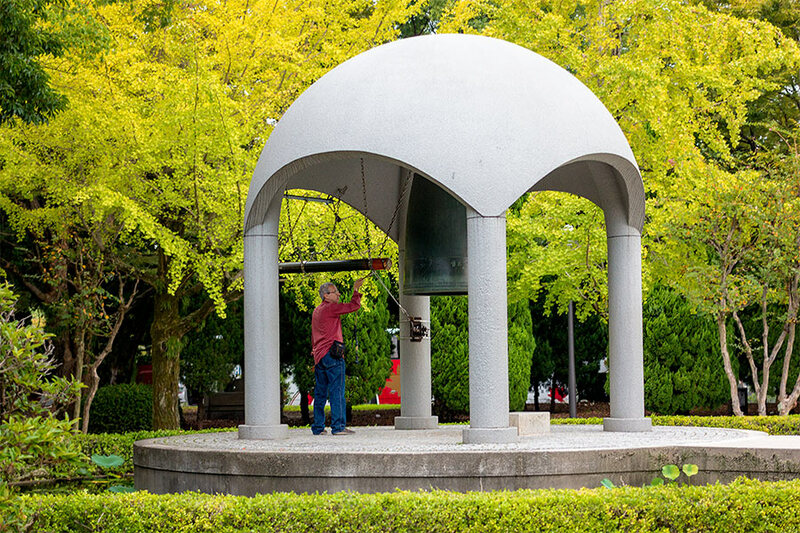 The Peace Bell, carved with a map of the world without borders, symbolizes Hiroshima’s vision of world peace. Perfectly framed in the Cenotaph stands the A-bomb Dome and Flame of Peace — a fire that will burn until the abolition of nuclear weapons. 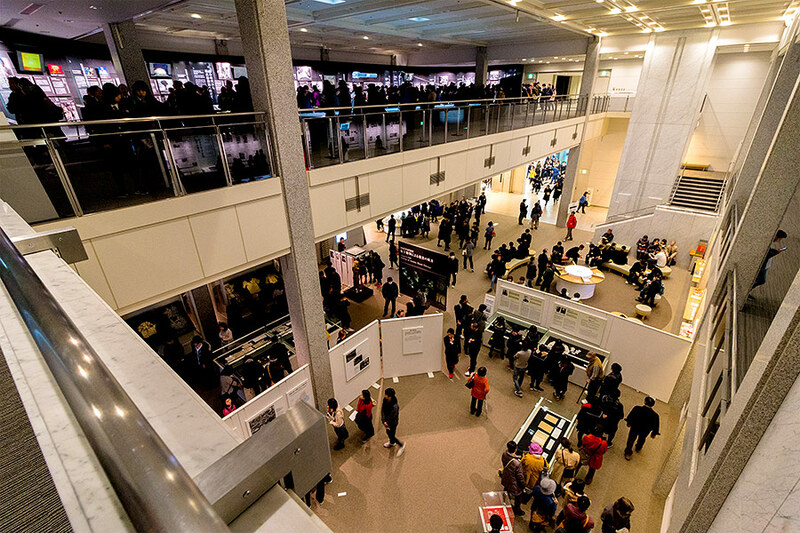 Newly renovated, the Peace Memorial Museum contains a wealth of information and artifacts about the atomic bombing of Hiroshima. “I don’t like looking at sunsets anymore,” says Michiko Yamaoka. The story is her mother’s, but she tells it as if she were there. On August 6th, 1945, her mother Kiyoko, then 20 years old, witnessed the atomic bombing of Hiroshima, and the subsequent fires which ravaged the city long into the night. As a member of Hibakushogen no Kai, Yamaoka is one of more than a hundred people entrusted with learning and retelling the stories of the hibakusha, or A-bomb survivors, the youngest of whom are now in their 70’s. Survivor’s stories, though each very different, generally begin with haunting similarity — “I saw a bright flash” or “I was knocked unconscious,” and always include the obligatory, “I was X kilometers from the hypocenter,” a figure describing the speaker’s physical proximity to the middle of hell on earth. Yamaoka’s mother, Kiyoko, had been 2.4 kilometers from the center of the blast and, after being knocked unconscious, awoke to a scene from a nightmare. Visiting the Peace Park today — the solemn and beautiful expanse of greenery and monuments sitting atop the ashes of Hiroshima’s former bustling downtown — I can hardly imagine that it was once a scene of such incomprehensible horror. Though my first visit to the Peace Park, A-bomb Dome, and Hiroshima Peace Memorial Museum was some years ago, I keep coming back. There’s just so much to discover here — to try to understand. Fortunately, Yamaoka is an excellent guide with an incredible repertoire of information at the ready — not only in Japanese, but in English as well. Somewhat bafflingly, the people of Hiroshima generally hold no animosity toward Americans, despite the atomic bombing. I’ll never forget the first time I stood in front of the A-bomb Dome. The sky at the time, conspiratorially moody, sent shafts of golden light streaming through glowering grey clouds, as if nature itself wished to remind me that hope exists even in darkness. I’m certainly not the only person to have felt this way while gazing upon the structure. In fact, the now world-famous anti-war slogan “No More Hiroshimas” first appeared scrawled on the scorched ruins of the A-bomb Dome (presumably by an American soldier) less than one month after the bombing. Seeing the aftermath of nuclear devastation, even when unaccompanied by dramatic weather, has that effect on people. Amazingly, those living in Hiroshima after the bombing also experienced this. Amid the ruins, people became overwhelmed not only with grief, but with an almost feverish hope to rebuild. And for many, that hope expressed itself as a passionate desire for a world without war — a world where what happened to Hiroshima would never happen again. The spacious streets, logical grid layout, beautiful riverside pathways, and abundant parks which characterize the city today all owe their origin to those passionate dreamers who, in place of their hometown which vanished in the flames of war, envisioned a City of Peace rising from the ashes. The Peace Park (called in Japanese Heiwa Koen) formed part of this initial plan, along with the 100 meter wide street now known as Peace Boulevard (Heiwa Odori), which runs along the park’s southern border. In 1945, the space occupied by the street was being cleared as a firebreak to protect against fires spreading from conventional bombing, and hundreds of mobilized junior high school students were assembled there to help with building demolition when the atom bomb exploded. Among them was Yamaoka’s aunt Atsuko, then 13 years old. Yamaoka’s mother rushed into the ruins of the city to try to find her little sister. Everywhere she looked, she saw people lying helpless on the ground. The fires had burned so hot that victims were overcome by thirst. As her mother passed by, always someone would cry out to her for water. However, at that time people believed that giving water to such grievously injured people would kill them, so she passed by without helping. After circling the A-bomb Dome, we cross the river to the Peace Park, passing by a monument dedicated to the mobilized students, and another dedicated to the children who suffered, years later, from the effects of radiation. Everywhere I look, I see water — not just the river, but fountains and ponds built into the park, as well as water bottles placed among the monuments as offerings to the dead. 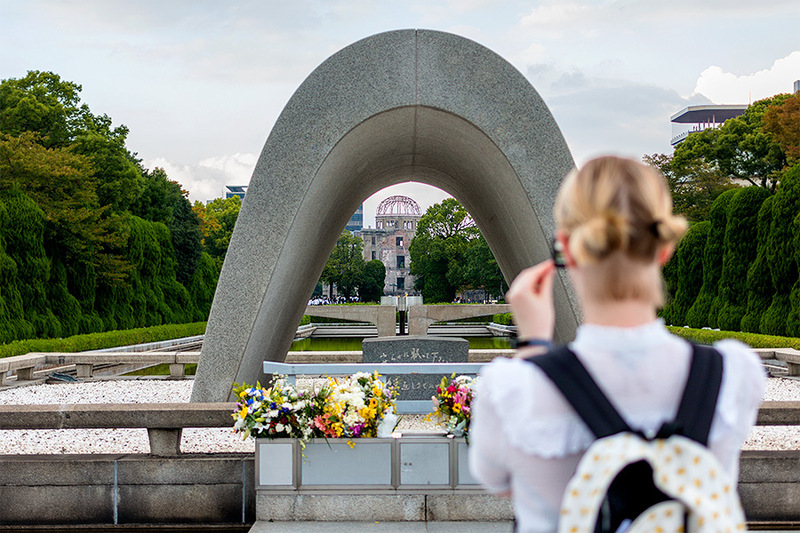 I snap a few photos and we head deeper into the park, stopping to pay our respects at the Memorial Mound — a crypt containing the ashes of some 70,000 unidentified victims of the bombing. Due to the intensity of the atomic heat rays, many victims were burned beyond recognition. The descendants of those who scoured the ruins in vain for missing family members come here to pray for the souls of their ancestors. At last, Kiyoko heard that her sister had been evacuated to Ninoshima, an island in Hiroshima Bay which, at that time, housed a large military hospital. “The hospital was filled with victim’s groans,” says Yamaoka. In the Peace Park, we at last come to the Cenotaph, a simple concrete arch covering a stone casket containing a register of all those known to have died due to the bombing. As of August 6th, 2017, the register contained the names of 308,725 victims. From the unique vantage point of the Cenotaph, I can see through its arch the haunting ruins of the A-bomb Dome and, dancing between, the Flame of Peace — a fire that will burn until the last remaining nuclear weapon in the world is dismantled. After the tour, I’ll head to the Peace Memorial Museum which contains a wealth of information about, and countless artifacts from, the bombing, as well as a cafe, bookstore, and gift shop. And chances are I’ll pick up another book while I’m there — I always do. But no matter how many books I read on the subject, or how many times I visit the Park, Dome, and Museum, I still can’t imagine what the people of Hiroshima really went through on August 6th, 1945. I mention this to Yamaoka, and she smiles reassuringly. Later that day, sitting in the Hiroshima Peace Park and watching the beautiful orange glow of sunset play across the silent ruins of the A-bomb dome, there’s one thing at least I do know — that there are some things no one should be able to truly understand.